I teach a course on the Death Penalty every few years, and it’s coming up again next Semester, the first time I’ll teach it with the group blog The Death Penalty. I’m priming the blog with some content ahead of time. 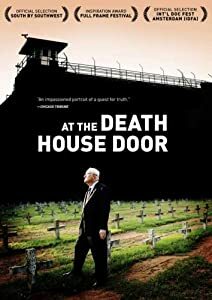 Yesterday, I watched the documentary At The Death House Door (thanks to Netflix instant access) – it was just released last year. It’s just perfect for this course: it opens up the topic so that the viewer has a lot more to think about afterwards than they did before. Most students come to the class with an “of course” opinion on the death penalty – “of course I’m against it” or “of course I’m for it.” My goal for the course is that everyone will have problems or unresolved questions with their viewpoint when they leave. (Oh, sociology is such a happy field!!) I’ve always had the “of course I’m against it” position as part of a consistent ethic of life. When I learned more about the cases, the lives of prison workers and other inmates, when I discovered the profound impact that jurors and others experience, I discovered that there was much more to these situations than “for” or “against” one particular action. The movie At the Death House Door opens a window into the web of complex relationships and emotions that surround every one of these cases – and many others than involve violent crimes. The movie focuses on Carroll Pickett, the prison chaplain at Texas’ infamous Walls Unit. He accompanied 95 people through their executions, including Carlos de Luna, whom many now think was literally a bystander to the crime but was railroaded through the system. A very self-contained man, he narrated tapes after each execution rather than talking with anyone; the film draws on those tapes, which reveal the complexity and depth of the man. Interviews with his family, the families of executed prisoners, death penalty activists, and other prison workers provide other perspectives on the entire process of the death penalty in America. It’s not an easy film to watch, but it’s certainly one that is well worth seeing.